You remember Sprite - the rescue cat who doesn't like rejection and chewed up all my rejection letters from agents? Well I let her decide the winner of the recent DFOTP book giveaway. The question was: what was the name of Jane's frog that Cyd accidently kills in the opening pages of the book. The answer was Frogzilla. The person who thought the right answer was cupcake - seriously? really!? Out of the right answers, I let the cat decide on the winners. There were two books to give away. One book goes to Amani and Ife a 9 and 11 year old brother & sister team in Kelowna, B.C. The book is on the Canada Post dog sled as we speak. The other book was won by Beverly out of Colorado. Beverly is an avid collector of Nancy Drew memorabilia and proud to call herself a Nancy Drew Sleuth. There will be a big conference in 2010 to celebrate 80 years of Nancy Drew. You can find more about it on the link. Beverly, your book will be on the Canada Post dog sled as soon as I hear back from you about your address. 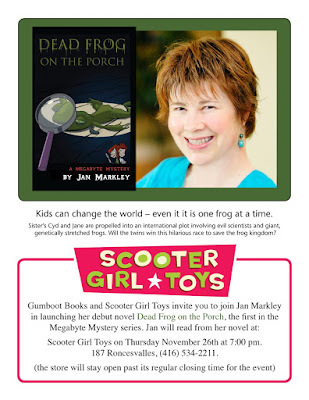 In other news, I will be in Toronto on Thursday November 26th at Scooter Girl Toys for a book launch event. Tell your friends. And your enemies. And your frenemies. Heck tell everyone!